Simplify Deep Learning Library usage on Linux and Windows! 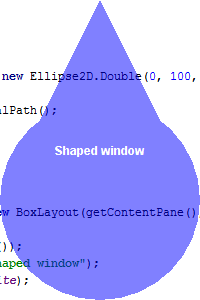 Per pixel translucency : Make a part of the window translucent. We'll see all this features in that post. All the examples are tested in Windows Seven 64 bits, because the transclucency isn't supported in Ubuntu 10.04 at the time I write the article. 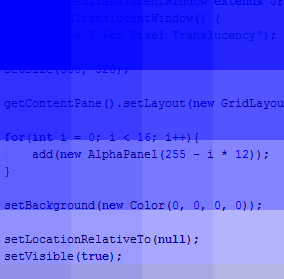 Note : We disable double buffering to remove artifacts that come when double buffer a translucent window. The example is very simple of course, but you can imagine doing a lot of things using that feature. 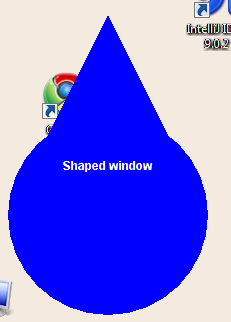 And now a crazy new feature : shaped windows ! Here we are. 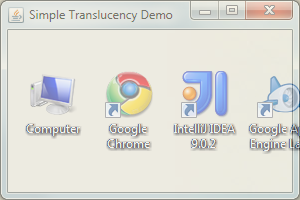 We've now covered the new translucency features of Java 7. I think it's really interesting and make Java Desktop Applications more competitive. But I think there is still work to do in Swing before doing that kind of fun stuff.